Maxinutrition Thermobol is high in chromium to support the body’s metabolism of food, and to help maintain normal blood sugar levels. Chromium also contributes to normal macronutrient metabolism. You must be 18 years or older to purchase this product. Take up to 3 tablets daily with water, split evenly throughout the day. If you are using Promax Lean, limit yourself to 3 servings of both products combined in a day. Bitter orange peel powder, L-tyrosine, caffeine anhydrous, maltodextrin, bulking agents (cellulose, calciumanhydrous, maltodextrin, bulking agents (cellulose, calcium phosphates), green tea powder extract, glazing agents (hydroxypropyl methyl cellulose, polydextrose, talc), medium chain triglycerides, chromium picolinate, anti-caking agents (magnesium salts of fatty acids, silicon dioxide), guarana seed powder, B vitamins (pantothenic acid, thiamin, vitamin B12, biotin), cayenne powder extract, colour (titanium dioxide). Food supplement tablets containing L-tyrosine, B vitamins and caffeine plus bitter orange peel, green tea extract and guarana. Contains caffeine: 444mg per 3 tablets. Not recommended for children or pregnant or breast-feeding women. Food supplements should not be used as a substitute for a varied and balanced diet and a healthy lifestyle. Do not exceed the recommended daily intake. 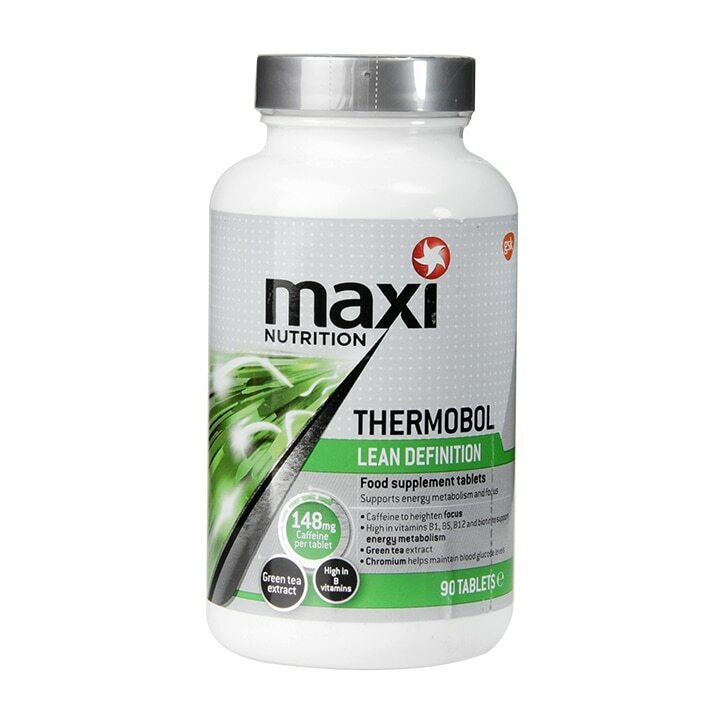 MaxiNutrition Thermobol is rated 5.0 out of 5 by 3.